Throughout the ages, jugglers have been the entertainment to kings. Few people have developed the art and skill of juggling, and has been an intriguing mystery to most who get to watch it. To the average person, juggling is a novelty, and might not be aware of how far some have taken it. 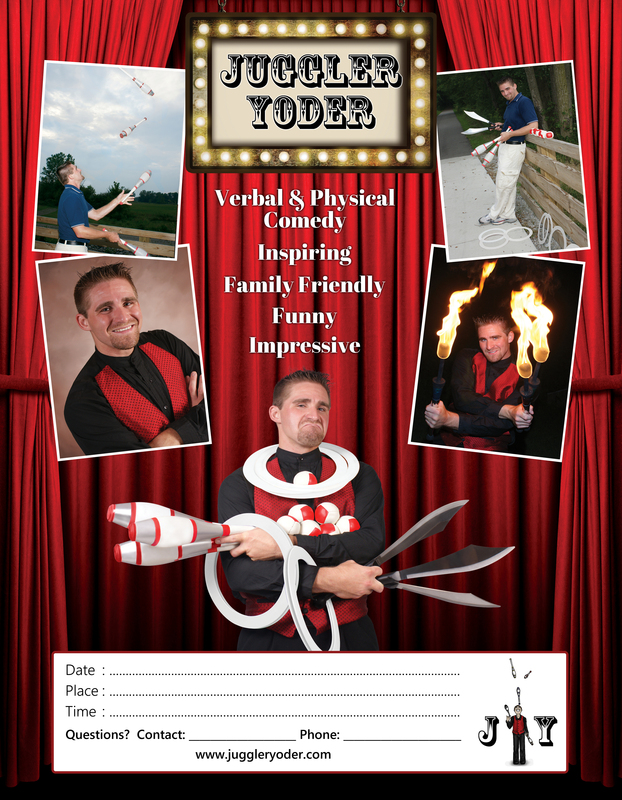 If you are looking for entertainment for your event or party, JugglerYoder’s show, may be what you are looking for. He has been trained by some of the finest and technically skilled jugglers in the world, and is the President of the Christian Jugglers Association. Jugglers have gone back and forth about whether juggling should be called a sport or an art form. But here at juggleryoder.com, both are welcomed and encouraged. So take a look around and become inspired by both the art and skill of juggling. My Brouchure and Flyers can both be downloaded below.